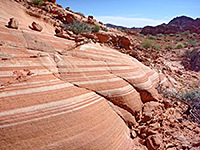 The brightly colored red, pink and orange Aztec sandstone seen most prominently in Valley of Fire State Park also occurs at other locations around the north and west shores of Lake Mead including the Whitney Pockets, the Redstone picnic area along the Northshore Road (NV 167), and at the Bowl of Fire, also close to the highway and reachable by a cross-country hike of around 2 miles. Here the rocks are exposed at the foot of a steep limestone ridge (part of the Gale Hills), on the north side of Callville Wash, near which are two other interesting sites - Anniversary Mine and the narrows of Lovell Wash. This region is just within Lake Mead NRA but is quite undeveloped and little visited, unlike the often rather busy state park to the north, and while the rocks are not as extensive, covering an area of 1 by 3 miles, the variety of color and form is comparable. 21 views of the Bowl of Fire; gallery, slideshow. Panorama in the middle of the rocks. One possible start point is along Northshore Drive at the Callville Wash crossing, by the start of the rough track to Lovell Wash; from here the Bowl of Fire is a 2.5 mile walk away, mostly along the wash, a route which is drivable by 4WD vehicles. For hikers, a slightly shorter option is to park along the main road one mile east, at a pullout overlooking the wide valley of Callville Wash. The route is then over stony, undulating land to the wash, across and up the gently sloping ground on the far side into a narrower, rockier streambed beneath a grey-black ridge, then up to a saddle at the head of the drainage, which borders the southwest edge of the formations. Cross-country hikes to the Bowl of Fire are also possible from two other roadside overlooks further east. 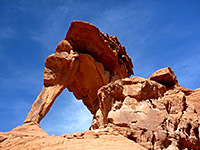 Just as in the Valley of Fire, most of the Aztec sandstone in the Bowl of Fire is dark red and heavily eroded, with less common outcrops in paler shades of yellow, pink and orange. 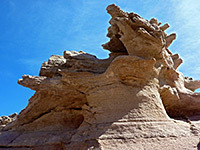 The formations too are similar, including small arches, bowl-shaped cavities, petrified dunes, small pinnacles and at least one elephant-like rock (like the famous formation in the state park). The pink sandstone generally forms the uppermost parts of the region, though to the northeast a line of red cliffs rises higher. Photographically interesting rocks are not necessarily easy to find since most areas are rather uniform; large blocks of sandstone whose surface is weathered only into small scale features. These outcrops are separated by open land of sand dunes and dry washes, some lined by patches of nice, smooth, banded sandstone. Vegetation in the vicinity includes occasional large barrel cacti (ferocactus cylindraceus), the very spiny cotton top cactus (echinocactus polycephalus), the spineless beavertail (opuntia basilaris) plus a selection of flowers and shrubs, most visibly (in spring) the brightly colored indigo bush.